These new handy scissors are shrunk down version of the popular Axus Decor wallpaper scissors. Like their bigger brother, they feature a precision ground, ultra sharp blade that is sharp all the way to the very important tip. They will cut through virtually any wallpaper or fabric like no other! 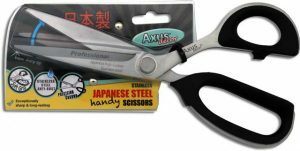 Made from high quality Japanese stainless steel, they will not rust and will last for years. Being lighter and smaller, you can carry them around more easily as you work and they give better control when getting into tight corners. Handy to keep in your kitchen drawer too!